The Piazza San Pietro at night. The Piazza is the site of public masses and worldwide papal addresses. is in the hands of appointed officials who oversee the Curia. Hersey, George L. High Renaissance Art in St. Peter's and the Vatican: An Interpretive Guide , 1993. Hutchinson, Robert J. 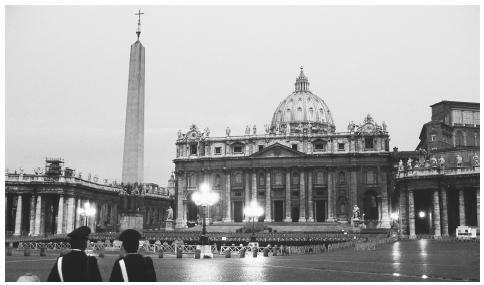 When in Rome: A Journal of Life in the Vatican , 1998. McDowell, Bart, James L. Stanfield, Elizabeth L. Newhouse, and Charles M. Kogod, eds. Inside the Vatican , 1993. Reese, Thomas. Inside the Vatican , 1996. Roncalli, Francesco. Vatican City: Vatican Museums , 1997. Steinfels, Margaret O'Brien. "How the Vatican Works: An Interview with Thomas J. Reese." Commonweal , 123 (4): 10–13, 1996. Stickler, Alphonso. 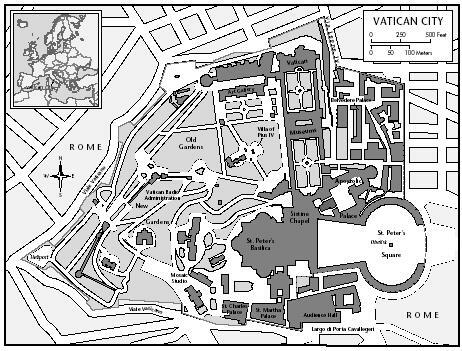 The Vatican Library: Its History and Treasures , 1989.
world smallest country .I can not emagine that it shold be so small .But excellent and charming places.So my plan is to go the Vatican city and watch it . Actually I am from Manipur Its so far from there,but i want to go to vatican city and watch it .I love your dress code and dress style .I never imagine it . Vatican city is the smalest country of the world . But it had their own culture and tradition. outside of the regular mass tradition? need more on food please i am doing school project and can get most of the information elsewhere :) not that i would... but cant find food anywhere! need more on food please i am doing school project and can get most of the information elsewhere :) not that i would... but cant find food anywhere! hope you can find some info and put it on here! I really liked this website. I used alot of the information and it helped me alot. I would like to know the everyday life of the inhabitant. What routinely or basically they do. How does their life go on about. As a centre of global Catholics how do they communicate. Do Bishpos and priest around the world visit the Vactican. Do they have any kind of forums, convention,core curriculum etc. Are the inmates been paid do they have vacation to visit their family and friends. I imagine it being very crowded and walled, but it is a small country, meaning no harm. This information was very useful, but it could use more, maybe more on culture acts, music, and what they normally wear for a casual look, thanks again for the information. Great and interesting information, but there is nothing on lodging, food, or major attractions. There also isn't very much information on the art and artists. Bernini, Michelangelo, and more. This link has ALMOST all I need. All you need are the customs and traditions! Unless I didn't look good enough, you had nothing directly on traditions. Please try to add some in, it would be good for kids with school projects or assignments. Thank you. I love Vatican City and Rome. As a Dominican Friar I lived at the Dominican General House Santa Sabina. A ancient pagan temple hundreds of years before the Holy Father gave it to Saint Dominic. Founder of The Order of Friar Preachers. Aka. Dominicans. The ancient history of the eternal city can be over whelping but enjoy what you can. go out into the various Square at night and enjoy a coffee or glass of Italian Wine. Walk with the people who come walk the squares at night. many churches have various musical performances in front of the church. All is FREE to the public. I visited Vatican City along with 10 person on the occasion of Easter-2012 and found very nice. Mostly people having desire to visit there but no proper arrangement at Government Level to facilitate the visitors. If any one window operation for pilgrimage would be established there so many people can visit there and also increase tourism and income. 1What is the Pope' s responds to the SIRIUS PROJECT information? 2 Does Pope Frances believe God may have created other beings on other planets? 3 please tell Pope Fances I pray for his intentions and him, that he is loved and thank him for his commitment to the priesthood. I love da vatican city soo much. thank a lot for da info.